The Iranian -American Cultural Organization of Houston presents a concert in celebration of Mehregan, Persian Harvest Festival, on Saturday October 11, 2008 from 8 pm to 12 pm at Morris Cultural Arts Center Theater of Houston Baptist University. 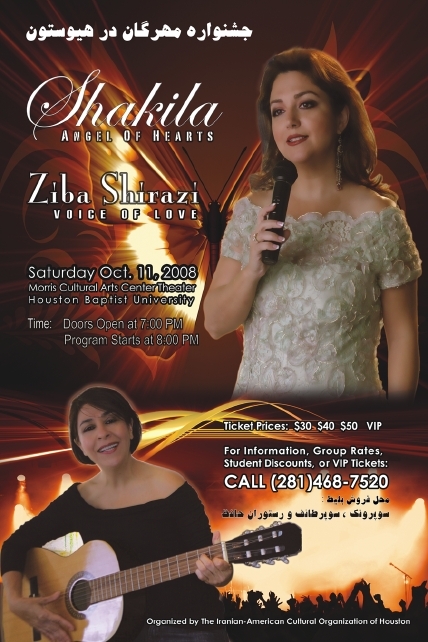 This concert features the legendary Shakila, Angel of Hearts, who performs her best songs in classical Persian music. The concert also features Ziba Shirazi, Stories of Love and Life, who will perform with American Jazz band directed by Houston's very own accomplished pianist and composer Dr. Jose-Miguel Yamal. The Mehregan celebration also will host art exhibits from local artists. Special discounts available for students and group purchases. For information call (713) 213-4500 or email nayeb@stthom.edu. Respond to this email nayeb@stthom.edu with email address of three of your friends to enroll in drawings for tickets for the concert. Three respondents receive two tickets each by random drawing on Thursday October 9, 2008. Please do not send multiple emails. For more information, please visit the following site.